Proven testing and performance design are making FIREXIT® compounds the ultimate jacketing and insulation materials for plenum, riser and tray cable manufacturing applications. 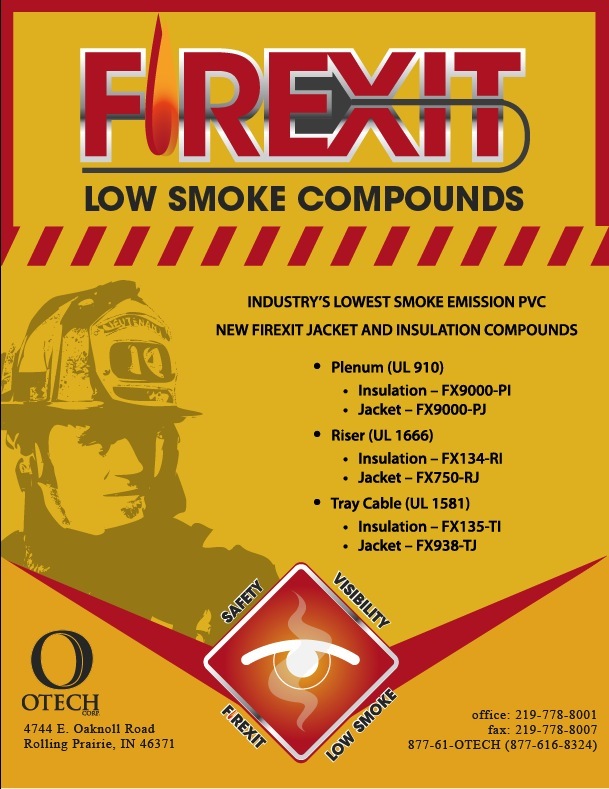 “Without a doubt, we believe FIREXIT® compounds are the safest products available for cable designers and installers currently in the market for top of the line safety, lowest smoke, and competitively priced cable compounds,” says Jack O’Donnell, OTECH Corp. president, (www.otechcompounds.com). With exceptional processability in standard extrusion equipment used for PVC, FIREXIT® compounds are quality performance and improved-­‐cost alternatives to some fluoropolymers. Innovative formulations include: lead and bromine free solutions; enhanced low smoke, fire-­‐resistant materials optimized for use as optical fiber buffer compounds, thin wall insulation and jackets. These formulations can be customized to be sunlight resistant. As an innovative compound technology manufacturer, “We continually look for ways to improve the market and we realized these ‘enhanced low smoke’ compounds just weren’t available, so we created them,” says Jason Page, Vice President of Operations at OTECH Corp. The newly needed compounds were created as a result of OTECH’s continual commitment to innovation and the company’s mission to develop the undevelopable for the wire and cable industry. True to OTECH’s name, each newly developed compound is tested and re-­‐tested to ensure that these each meet our company’s stringent requirements.